Game 1: Boston College (+3) over NORTH CAROLINA - BC fans, bummed out because of the Red Sox premature exit and the blandness of the Matt Cassell era, rally behind the surging Eagles. Yeah, right. They're more interested in the Celtics' exhibition with Cleveland on Tuesday. And can we finally accept that Tom Brady isn't Mother Theresa, Albert Einstein and Eleanor Roosevelt rolled into one perfect, almighty human being? In fact, he's kind of a dope. In his latest episode, he dumped the Pats' team doctors so he could have his knee surgery performed in California. Now, he's undergone three procedures to attempt to stem infection and could be looking at having a second reconstructive surgery because his La-La land doctor botched the first one worse than Bruce Jenner's facelift. Not for nothing, but the Browns' suspended Kellen Winslow for less this week. Game 3: PITTSBURGH (-9.5) over Rutgers - On the Big East conference call Monday, a New Jersey reporter asked every coach if he believed "a sleeping giant" had been awoken after Rutgers' oh-so-impressive win over UConn Saturday. Cincinnati coach Brian Kelly was the only one to acknowledge, albeit politely, the ridiculousness of the notion. The giant goes back to sleep Saturday. Game 4: Georgia (+1.5) over LOUISIANA STATE - Loser can say bye-bye to national title hopes. Neither has what it takes, anyway. Game 5: South Florida (-4) over LOUISVILLE - Matt Grothe has passed injury-riddled Pat White as the best quarterback in the Big East this season. He's also been cheated by the local baseball outfit, who just happen to be playing in a World Series nobody is watching. The Devil Rays (they'll always be the Devil Rays) are getting all the publicity for their haircuts, but Grothe is the originator of the "grow-hawk" in Tampa Bay. Give the kid some credit, even if it looks awful. Game 6: KANSAS (-1.5) over Texas Tech - A random student who kicked a 30-yard field goal as part of a halftime promotion last month has been added to the Texas Tech roster, and could be kicking for the No. 8 team in the country Saturday. 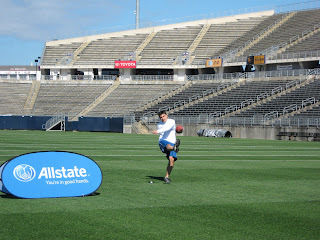 Texas Tech must not have heard that I drilled my 35-yard attempt at Rentschler Field last month to win $500 for the charity of my choice (Connecticut Hospice) in a promotion run by Allstate Insurance. Must have been all of the red tape surrounding my eligibility that scared them away. I mean, that kick would have been good from at least 36 yards. Hey Texas Tech! I think I have some eligibility left. Call me, we can talk. Game 7: OHIO STATE (+2.5) over Penn State - Joe Paterno is finally going to allow doctors to examine his bad hip next week. He's only been hobbling around like an old, wounded leprechaun for a month. The best part is, JoePa, almost 82, says he got hurt demonstrating the proper way to execute an on-sides kick in practice. Tough old bird, some might say. Meh. Sure, I would have paid anything to witness the spectacle of Paterno, in his high-water khackis and black cleats, perhaps wearing a leather helmet with no facemask, instructing the proper fundamentals of booting the pigskin...I'm still not impressed. Getting hurt tapping a football? When he was 82, my grandfather, every October, was digging multiple trenches in our backyard and burying his fig trees for the winter. (Don't ask. Fig trees are a big deal with old Italian men, just like Sfogliatelle and anisette-spiked coffee. All I know is I had to help bury those trees every year, and it was borderline child-slave labor.) And he did it into his 90s. That's toughness. For the non-Italians, this is Sfogliatelle (pronounced shvoy-a-DEL). It's a variety of pastry. Game 8: Oklahoma State (+12) over TEXAS - Just seems like a lot of points to be giving up to another 7-0, top-10 team. The good news is, there's always a chance Mike Gundy flips out on a newspaper columnist and announces to the world that he's even more of a man, he's 41 now. Game 9: Virginia Tech (+5) over FLORIDA STATE - Citing he got what he deserved, Terry Bowden feels his brother, Tommy, had to go as coach at Clemson. 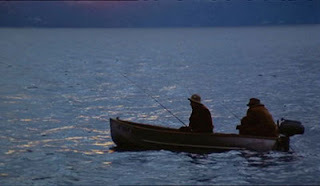 There hasn't been a display of brotherly "love" this touching since Michael Corleone sent Fredo on a fishing trip out on Lake Tahoe with Al Neri. Should be a fun Christmas for the Bowden clan. "I know it was you, Terry. I know it was you." Game 10: Virginia (+12) over GEORGIA TECH - What's gotten into Virginia? Anyone? Game 11: ARIZONA (+16.5) over Southern California - Just a feeling. Plus, it's a shout out for the wife's alma mater. Game 12: Penn (-2) over YALE - Disappointing season for the Bulldogs and star tailback, New Britain's Mike McLeod. Still, it's a big deal whenever Penn, Princeton or Harvard comes to the Yale Bowl. Strange things afoot with the blog today. If picks aren't showing up, keep trying. Huzzah - edging into first! Hey Chip, just fyi, the Celtics game on Tuesday is the NBA Regular Season Opener, and the raising of Banner 17! So there is some excitement surrounding that game, justly so. Maybe I can blog about how I went from being an NBA superfan to not even knowing when the season opens in the span of 10 years. Finally over .500 for a week! 2. Cincinnati. What will the headline be on Sunday morning? "Bearcats Maul Huskies." 5. South Florida. Does Matt Groethe literally drool when he thinks about going up against the UConn defense? 6. Texas Tech. Has anyone seen their ucoming schedule? The Red Raiders play ranked teams EVERY week. Pay attention, Randy Edsall. 7. Penn State. Can't pick against Joe Pa.
8. OK State. T. Boone Pickens is buying himself a pretty good football team in Stillwater. 9. Virginia Tech. Someody wake up Bobby Bowden and tell him his team has a game this week. 10. Georgia Tech. Incredibly, inexplicably, Al Groh wasn't the worst coach in the history of the NY Jets. But, he was pretty close. Hey Vinny, we may be delusional and knowledge challenged...but...what was that other thing you called us? As always, I am ready to meet anyone, anytime. Two years ago i challeneged people to meet me at the Rent - only detroittigershater had the cojones to show. Whatever West Haven chump wants to challenege me either here or online, I'll beat them like a drum.